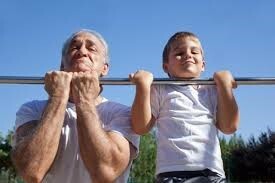 Grandparents – Get Fit With the Kids! Children today are getting less physical activity than they did in previous generations, to the detriment of their health and physical development. If you are a grandparent (or have friends with grandchildren), you might agree that kids today have less unstructured free play than you did during your own youth. When you were a child, you might have spent time after school and on weekends riding your bike, climbing trees, or just wandering the neighborhood until you found some other kids to play “sardines” or “kick the can”. Children today are spending more time in front of televisions, computers, and mobile devices. Grandparents can be an important part of the solution, when they combine family time with physical activity. Many of our clients list keeping up with their energetic grandchildren as one of their many motivators to get fitter and stronger. Over the next few weeks we will design several exercises you can do both on your own and with the younger generation. Getting older can often mean that we spend less time in physical activity, and with kids moving around less as well, why not set a great example and have fun at the same time! The first exercises can be done at the playground. First, find a monkey bar, and with your feet on the ground, and your hands on the bar, perform assisted chin ups while squatting at the same time, next, you can hold your grandchild while he or she pulls him/herself up with your assistance. Compare how many you could do, and encourage each other to do it again and add one more repetition! Next, find a park bench. Place your arms across your chest and sit down on the bench and rise again to standing position. Perform this exercise with your grandchild and count together, to see how many you can do. You can even try to pick up your speed together, and see how many you can do in 30 seconds. Email us at info@loveyourage.ca and tell us how many you can do!